While Thanos has existed in Marvel Comics since 1973, this enemy to the Avengers has recently appeared in the Marvel Cinematic Universe in films such as The Avengers and Guardians of the Galaxy. After collecting the Infinity Gems into the Infinity Gauntlet, Thanos becomes an omnipotent force of evil in the universe. For fans of this ultimate villain, Superheroes Direct features a variety of collectibles and apparel, including POP figures of his latest appearance, perfect to add to any villain collection or to complete a set of characters from the MCU. Keep checking back for more upcoming Thanos merchandise as it is made available. The mad titan Thanos has descended on Earth, preparing to decimate the planet in his attempt to court Death. 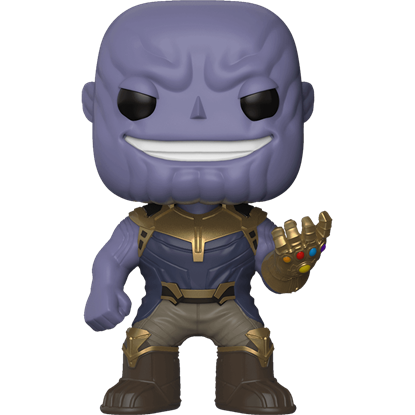 The Infinity War Thanos POP Figure depicts this ordinarily intimidating supervillain in adorable chibi detail.